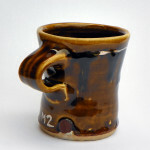 Once this mug was glazed and I held it in my hand for the first time, I realised that I love a much wider handle. 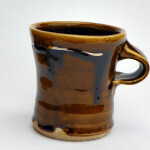 There is softness to the handle from the slip and the thick glassy iron glaze which breaks on the edges. 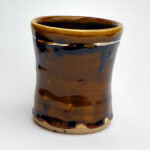 The local clay slip drips seductively down the pot, the low fire nature adding to darkness of the glaze. A stable pot that opens at the top, to be welcoming and inviting, ready for a hot drink on a cool summers eve, looking out at the gooseberries ripening on the bushes.